"Walking the Alps from winter into summer"
A new addition to the programme - a February evening meeting. 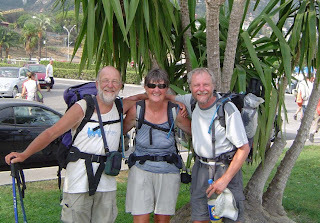 Our guests were Tivertonians Ivan and Sue Godfrey who talked about their charity walk in the Alps in 2007. Showing digital slides of their adventure, they explained the geology, geography as well as the flora and fauna of the route on their long distance walk. As Ivan & Sue are charity fund raisers, the club donated the proceeds of the evening to their nominated charities : Hospicare and Childrens Hospice South West. The sum raised was in excess of £230 which is a fantastic acheivement.